Interesting Real Estate related Tidbits from Lean Dean the Loan Machine. Understanding the makeup of your credit score is the first step toward managing and improving it. 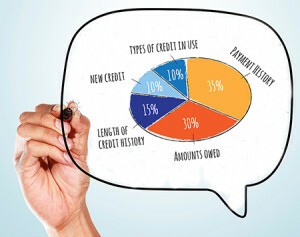 As you might expect, payment history is the most influential component in your credit score, followed closely by the amounts you owe. To lesser degrees, the length of time you’ve utilized credit, the number of new accounts or inquiries you have, and the various types of credit accounts you hold also impact your score. Overall reporting also looks at how these factors relate to each other in the context of your personal usage. Have a system to assure your bills are always paid on time. Avoid late payments or the excessive use of credit by maintaining a cash “cushion” to pay for unexpected expenses. Don’t “max out” your cards. It’s better to have a high credit limit with a low balance. Never close old accounts as the age of these can actually help your score. If you shop for credit, do so in the shortest time period possible to minimize inquiries counted against you. Don’t be afraid to use credit. You need several accounts in order to have a credit score. Just be sure to keep corresponding payments within your means. If you have established credit, don’t open new accounts solely for the sake of earning a discount on a new purchase. In the long run, you may spend more than you save up front by paying higher interest rates due to a lower score. Having more accounts also increases the task of making payments and the possibility of missing one. If you have questions about managing your credit, give us a call. We’re happy to help.